LSU's fantastic 28-7 season with a SEC regular season championship came to an abrupt end Friday evening in Washington D.C. as the No. 2 seed Michigan State made quick work of the No.3 seed Tigers, 80-63. The Spartans led LSU from beginning to end including a halftime lead of 12-points. The Tigers showed signs of life early in the second half when they cut the lead to four but within minutes they were behind again by double digits. 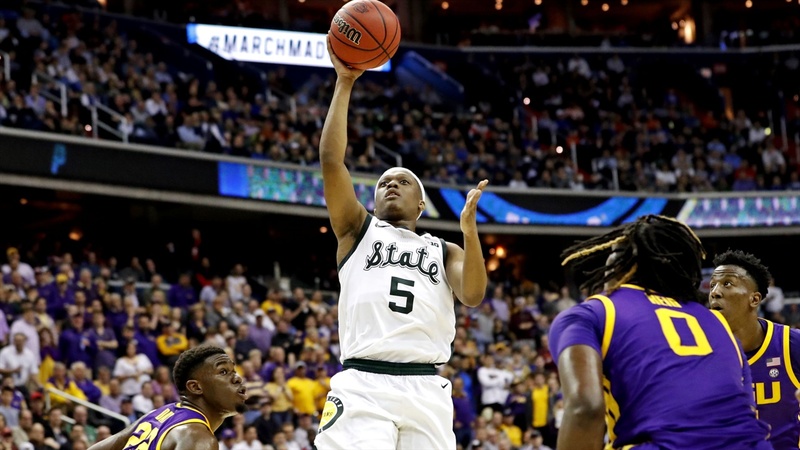 “I want to give Coach Izzo and his team a lot of credit they came out in the first half and established in the paint,” LSU interim head coach Tony Benford said. “We knew it was going to be a game of who could control the glass. LSU was led in scoring by Tremont Waters with 23 points. Forward Kavell Bigby-Williams added 11 while Naz Reid finished with 10 points and nine rebounds. Michigan St. (30-6), champions of the Big Ten, made 11 of its first 22 from beyond the arc and killed the Tigers with offensive rebounds. They finished the game with 13-of-32 (40.6 percent) from three-point range and 31-of-66 from the field (47 percent). Aaron Henry led Michigan State with 20 points. Cassius Winston added 17. Freshman forward Gabe Brown led the team with four three pointers and totaled 15 points. The Spartans advance to face either Duke or Virginia Tech on Sunday. After the game, Tremont Waters was asked about any long term decisions that have to be made now that the season is over and the uncertainty surrounding Will Wade and his indefinite suspension.